The Perfect Solution for Businesses Large and Small. With T-Quoter, you immediately have a quick and effective solution to help you become more profitable and efficient in your business while also making you look more professional! T-Quoter business management software is designed to allow you to put in all of your overhead expenses, labor expenses, equipment costs, and other variables to help you quickly and easily price out customer jobs. Since there are so many different shops and different ways to price things, T-Quoter was designed to handle almost any situation. You can use a formula driven model for pricing T-Shirts, price matrix pricing for your embroidery or work from a fixed price sheet for certain items - of course you can also manually override any of the prices at any time. Flexibility is part of the solution! With the built-in scheduler you can gain a better grip on your production schedule. You can see at a glance exactly what jobs are due and how long they should take to print. You can also define when and on what days all your screen printing, embroidery and other work orders are allowed to be scheduled. You can even specify which work order types are allowed to be scheduled at the same time giving you even more flexibility in scheduling. 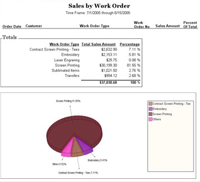 The Dashboard allows you to see every job at a glance and where it is in the production cycle. The color coding shows you the status of the job and the section the job is located in shows the production stage. This great feature allows you to see the importance of jobs that need done. Drag-and-Drop screen management makes workflow easier than ever! The Financial Reports creator is a great feature that contains 12 reports to help you run your business more efficiently and profitably. 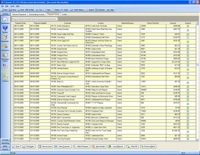 Included are a Collections Report, Sales Tax Report, Sales by Work Order Type, Sales Reps, Items and more!! Reports are colorful, easy to understand and even include charts and graphs! The customer maintenance screen allows you complete control over your customers and contacts. Not only can you store complete contact information and have customers with multiple contacts, you can also see complete information about the customer such as their order history and statistics relating to how profitable the customer is. The Accounts Receivable system in the T-Quoter is built to make it easy to track which customers owe money to your company. You can receive payments, see outstanding invoices, track customers' payment history, create credits, issue refunds, and void payments, all from one easy to use system in T-Quoter. The E-mailer is designed to allow you to email your customers their quotes or invoices, work orders, artwork confirmation sheets in the PDF file format. Your customer will see exactly what you would have printed out for them in your shop - in full color. A bulk emailer is also included to allow you to target market email campaigns. You can use the T-Quoter as your main Invoicing and Accounts Receivable program, knowing that it is going to reliably pass information to Quickbooks. 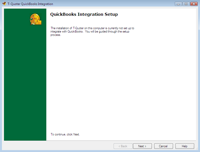 You won't have to export the invoices or payments to Quickbooks because T-Quoter will do it for you automatically after you have configured the simple integration.